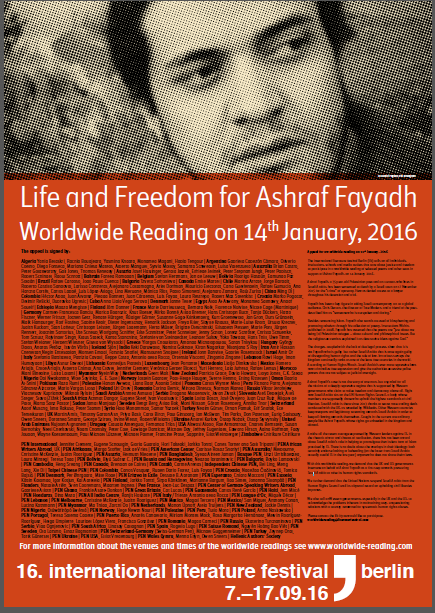 On 14 January 2016 – Ledbury Poetry Festival is participating in a Worldwide Reading of selected poems and other texts in support of Ashraf Fayadh, a Palestinian poet who has been sentenced to death by a Saudi court. The reading will happen at 1pm under The Market House in Ledbury. 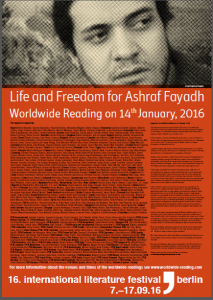 An appeal has been launched on Ashraf Fayadh’s behalf. Please come along and join us on 14.01.2016 at 1pm to show solidarity.